I hope you had a great week, mine could not have been nicer. Nothing beats spending time with family. We cooked, ate, played, shopped and went to movies. The house seems so empty today, having my daughter home just brings this house to life. Cooper's been wandering around the house all day, wondering where those 4 extra hands went that petted him all weekend long. We played a new game, Farkle. It's fast paced and a nice combination of luck and strategy. The rules are easy with next to no learning curve. If you're looking for a new family game, give this one a try. I had a list a mile long of things to do around the house today, but after not being in my sewing room for what seemed like forever, I decided I had earned a few hours and I took them. I was wanting to feel like I accomplished something and am feeling the Christmas spirit, so I decided to work on a Fat Quarter Shop Designer Mystery Block of the Month block. I had 3 to choose from. Block Five - Peppermint Pinwheels, by Carrie Nelson called my name. This block went together perfectly, the directions could not have been any simpler. Thanks Carrie! If you are waffling on joining this BOM, don't let your piecing skills be the reason you don't join. So far, all the blocks have been super easy to assemble, and I think cute as can be. I'm trying to avoid putting any of the blue fabric from this project into my blocks. Here are the fabrics that came with the kit, I like the fa la la fabric, but not the blue so much, so I made a few substitutions. Ta da, 4 down, 2 blocks waiting their turn, and one probably in the mail as I type this blog. I hope to be all up to date on my blocks before the first of the year. What better month than December to work on a Christmas quilt. and I picked up this pillow at Pottery Barn. I like to buy one new Christmas decoration each year. I usually try to get something after the holidays, on sale, but I saw this and thought it was a perfect match for my sofa. I had seen this pillow in the Pottery Barn catalog, but it looks much better in person than in print. I didn't even notice the jingle bells on the pillow until I saw it in the store. I'm not sure what type of needlework this is, but the detail is amazing. It's nothing but decorating and sewing for me this week, I'm hoping for a happy drive down that Mocha Trail. I've been enjoying this quilt the whole month of November. I made this quilt for the back of my red couch, but it hangs over the bannister instead. Once I finished this quilt I realized it didn't look good on the red couch, too much red, the one quilt I actually made for that couch and it didn't match. Oh well, almost all of my other quilts do look good on that couch. I figured I better share it now, in a few days this quilt will be packed up until Fall of 2012! This is lifetime quilt number 51 that I named "Eat More Pie"
Because of this panel on the back. I plan to be eating some pie tomorrow, I'll be celebrating a little holiday here in the states we call Thanksgiving. If it's not Thanksgiving where you live, I suggest eating some pie anyway, any day is better with pie. I would like to let you know, as I reflect on my many blessings, you, my blogging friends, add so much to my life. Thank you for making my small life so much fuller. I'm taking the rest of the week off, my baby girl is home and I plan to enjoy every minute of our time together. I'll be back on Monday! Best wishes for a safe and happy week, to you and your family, wherever you may be! I got a quilt back from the quilter!! This quilt's been gone for awhile, but it was worth the wait!! This pattern is by Glad Creations. I've seen this quilt on several blogs, it must be a popular pattern. The finished block size for the pattern was 12", but you know me and big blocks, I made mine slightly smaller at 9". No quilting suggestions were included with the pattern, and I was thinking about an overall design. 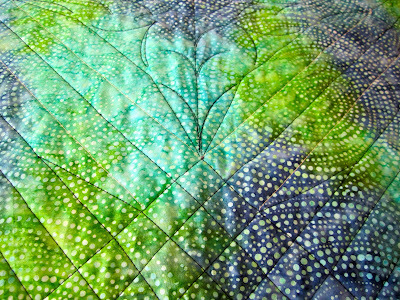 On my post where I blogged about finishing the top, I ask for quilting suggestions. Several folks thought an overall pattern would do nothing to enhance the circular effect created when the blocks were connected, and they were right! Dawn, at the Sewing Basket, could not have done a better job of bringing this quilt to life. The wonderful quilting on this project extends all the way to its edges. 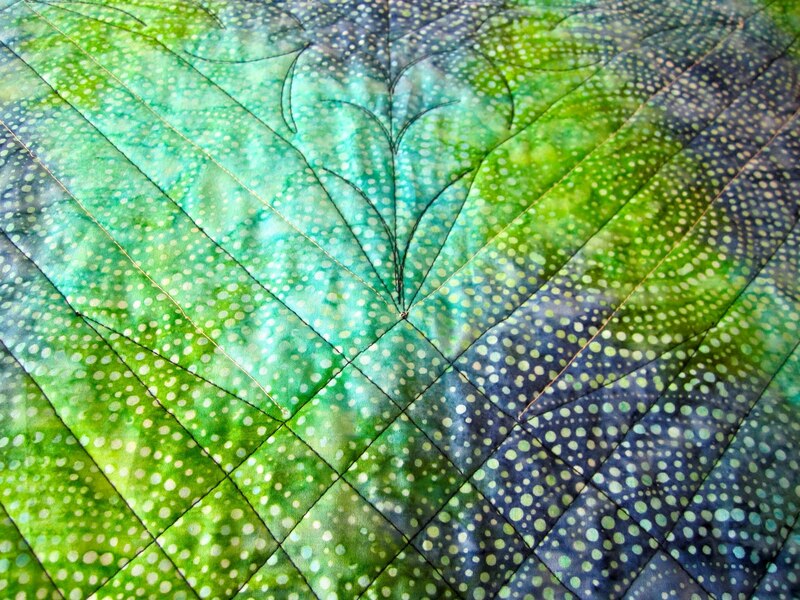 The work Dawn did in the border is as amazing as the center of the quilt. So here it is, home and ready to brighten up the gloomiest days of winter. This is my lifetime quilt number 56. It finished at 60" x 78", has 2,192 pieces, and is comprised of batiks from my stash. For more details on this quilt select "#56 Faceted Jewels" from my Lifetime Quilt list on the right of my blog, or "Faceted Jewels" from my "Categories List". When I'm not actually in my sewing room working on a quilt, a lot of the time I'm still thinking about quilting. Who hasn't bought a brand new family of fabric, then spent the whole night dreaming about how to use it? So when I'm not spending as much time in my sewing as I like, like right now, I'm still thinking about what I'm going to do next. Next being next quilt up, next month and even next year. I've recently updated my To Do List on my blog with 9 projects I already know I want to complete in 2011! So with all the time I've had to think about quilting lately, I have decided on what I'm going to work on the second I get off that Mocha Trail....it will be time for a Root Beer Float. 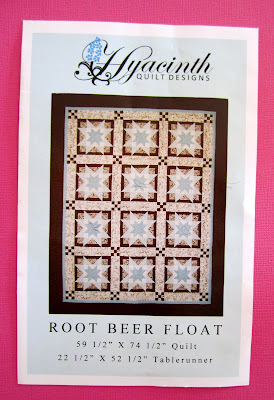 Root Beer Float is by Hyacinth Quilt Designs. 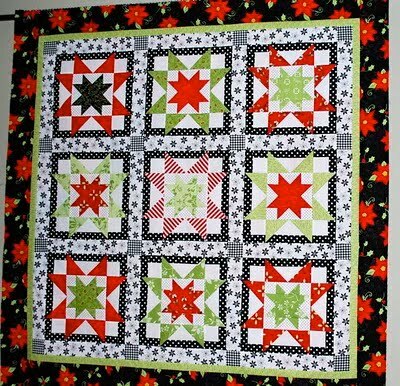 Several things about this quilt appeal to me, but the aspect that I like the most is how those outer star points just bust through the sashing, like they are so bright they can't be contained. Here's a little different twist of that pattern that Cindy, of Hyacinth Quilt Designs, just finished and is currently displayed on her blog. I think this is the size I'm going with, three blocks by three blocks. 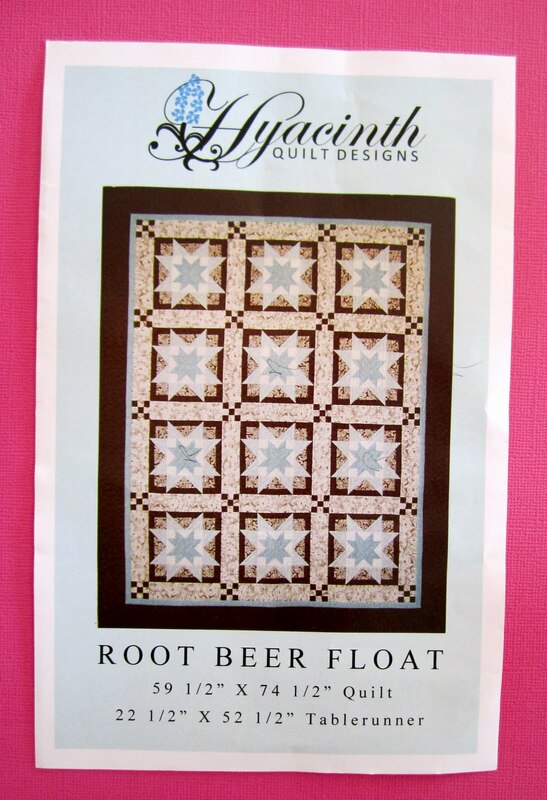 I ordered my pattern from the Hickory Stick Quilt Shop after seeing Root Beer Float folded on the end of Cindy's bed in her "Quilts on Bed?" post. and I've got it all spread out on those middle shelves in my sewing room so we can get to know each other better. I'm going with Olde World Style Fabric by Monique Dillard for Maywood Studio. I like to work with Christmas fabric in December, and while this fabric is far from Christmas fabric, the colors make me think of Christmas, and match my living room and kitchen perfectly. but I sure am having fun just thinking about it! 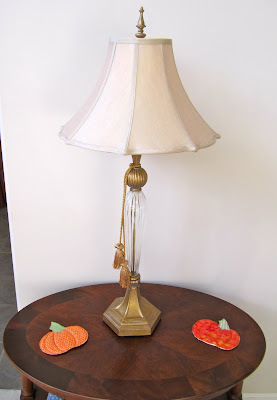 So Monday I blogged about winning these adorable pumpkins, made by Brandie. There was one contingency that did not cross my mind . . .
"Cooper, what do you think you're doing!!" "Hey you, YES YOU, come back here!!" "I'll trade you a chewy for that pumpkin coaster ......."
Bribery works every time!! Except, Cooper's not allowed on the couch...I'll take what I can get! and hopefully out of Cooper's eyesight! 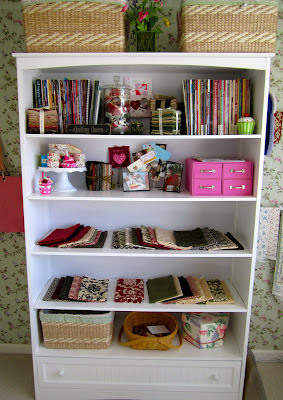 The only progress I've made in my sewing room is on my half square triangle units for Belle Meade. I'm getting up early and making a few while the house is quiet and before the menfolk are up. 356 down, an even 300 to go! It's so relaxing to start my day feeling like I've accomplished something before I've even had my first cup of coffee. I've finished the star blocks for Mocha Trail and am thrilled that you all think these blocks are winners. Nicole, at Sister's Choice, who is also working on this pattern, mentioned she made a star block then the alternate 9 patches block, to even things out. Great idea, something I probably should have done. I don't think my humility block is going to make the cut. So now it's on to these. I just need 11 more. And I'm sure you're all correct, once I get these blocks in the mix, things will improve. I tend to have an unrealistic expectation that my current project will surpass my last project. I've had a pretty good run, my last 7 projects are some of my all time favorites, but we'll see, maybe once the blocks are all done and the is quilt assembled, this project will really come to life for me. I'm not quitting until it's done, like it or not!! 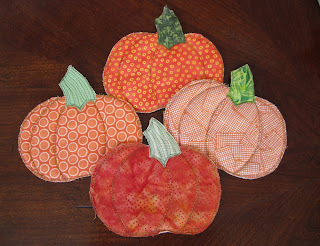 A book, Fresh Vintage Sewing by Joann Figueroa, some lovely fall fabric, and pumpkin coasters. I have a couple of Fig Tree patterns but this is my first book, I've really enjoyed reading it. Those fall fabrics sure will make a great table runner. I just love them! I have them setting out in my living room, they'll be out until Thanksgiving is over, and nobody better even think about sitting anything on them!! Thanks so much Brandie, I love it all.!! The time I'm able to spend in my sewing room just took a hit, it's official, I've started decorating for Christmas!! Saturday we got all the Snow Village houses out of the attic. My daughter is coming home for Thanksgiving and since she's home for such a short time, we like to have a few Christmas decorations ready to light up on Thanksgiving evening. We have our own little lighting ceremony once it gets dark, we turn out the lights, light up the villages, and eat dessert. If I can't be sewing, my next favorite pastime would be decorating. Getting each one of these houses out of their boxes and setting them up out all over the house is like Christmas morning to me. The first order of business, we have some winners . . . . . . I was thrilled you enjoyed my Easy Angle tutorial, even with the ruler upside down!! The winner of the Easy Angle ruler is . . .
Ruthie, from Threads of Mine. Who said, "Well, I have never seen this method and would love to win that ruler." And to you quilters who avoid making half square triangles, try this ruler, I can't bear to think of the number of patterns you're missing out on by avoiding this block! Now on to the 200th post giveaway . . . I loved reading all the comments about your fabric purchases and I'm a little relieved to find out there's no secret formula that I was missing out on when it comes to buying just the right amount. I was a little surprised by the number of folks who are really into those Charm Packs. I've never bought a charm pack, I'm more of a "get enough so you don't run out" kind of girl. And those charm packs, they don't look like they could make much of anything. I've made a couple of Miss Rosie patterns that called for charm packs, but I used scraps or fat quarters. But I'm drawn to patterns with small blocks, and I like variety, so I'm going to give those packs a try. What do I have to lose, 2 packs will run less than $20, and they don't take up much space. Between the comments left on my blog, and the emails from folks who couldn't leave a comment, 123 quilters were in the running for the fabric. The winner of the Fresh Palette by Carrie Nelson for Henry Glass Fabrics fat quarter bundle (now available online and at shops everywhere, or pretty much everywhere) is . . . .
" sometimes i buy fabric because it tells me to ... who am i to argue with a big old bolt of batik (or a fat quarter) who calls out my name as i am walking by? did you know when you started blogging that you had so much to say?" Dianne, when I started blogging, I knew I had lots to say, I'm a talker, but what has surprised me, is the number of folks who seem to enjoy listening!!! and am so glad I did! I like how this turned out, THANKS!! I should have payed closer attention to how I cut out those corner squares, but I'm keeping it in. I'm not crazy about the block design in general, it's too big and plain. I'm more of a 9 inch block person, but I couldn't shrink these down without radically changing the 9 patches block so I stayed with the size called for in the pattern. I thought my lovely Maison de Garance fabric would be enough to jazz up the blocks, now I'm not so sure. These blocks are taking forever to make, picking out the 3 fabrics, cutting the pieces for one block, sewing together one block, and I thought these blocks would be the fun part of this project. I have 3 or 4 more to go, then I'll start on the alternate 9 patches blocks, hopefully that will do something for these dull blocks and perk up my design wall, and my mood!! So, in addition to working on my latest quilt project, I've also been creating half square triangle units for a future project, Belle Meade, by Paula Barnes, which requires 656 of them. This pattern was also on Nicole of Sister's Choice Quilts' list, so we decided to work on the quilts together, after the holidays. We thought it would be a good idea to get a jump start on the hsts now. Carol, at Brown Quilts, thought she would sew along with us, then realized she had an even better method for completing this quilt. Start it, put it away, and forget about it. Carol's already finished her Belle Meade, click here for a looksie.....it's beautiful!! A real motivator for me...it's not too late for you, if you want to join in! It's been fun making the hst units and reporting my progress on my blog. I'm about a third of the way through them, they've accumulated quickly. I've gotten several questions about my method for making these beauties, so I figured a tutorial was in order. 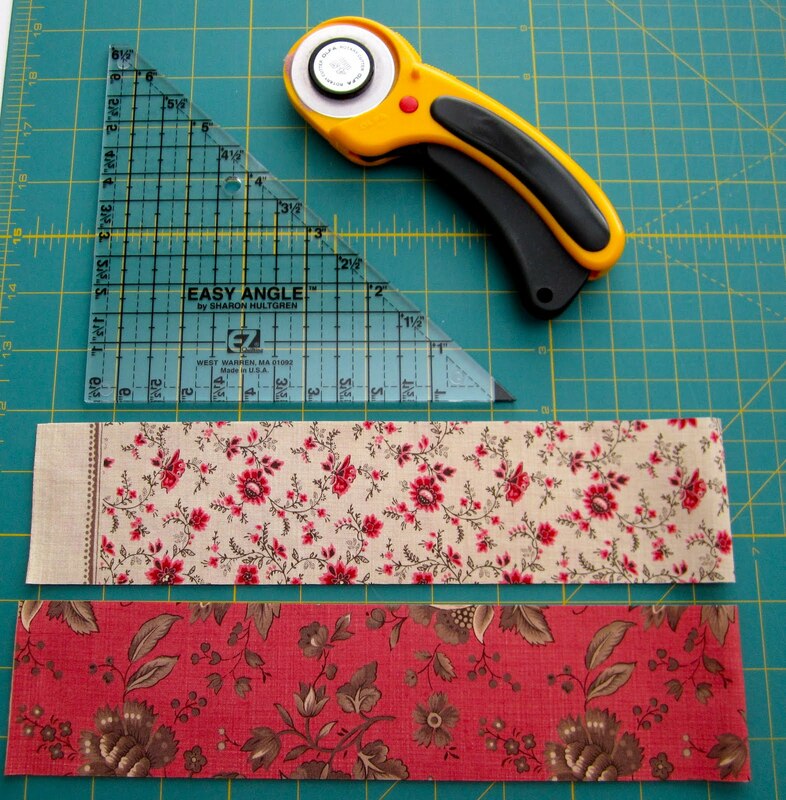 First off, you need an Easy Angle ruler, they're everywhere online and in quilt shops. You also need two strips of fabric the same width as the hsts units you're wanting to make, unfinished. Since my hsts need to be 2 1/2 inches, my strips of fabric are 2 1/2 inches. It's very important that the strips be the required width, any smaller, even a smidge, and your unit will be too small. to create a clean straight starting place. See all those number on that ruler, I don't know what they're for, I don't use them. and the bottom edge of the fabric, with whatever line on the ruler that fits. I have no idea why the ruler says 4", all that matters is that that line is straight across the bottom of the fabric. Then I spin the ruler around, line up the 3 edges, and cut on the 4th. Added Later - OK, I guess the reason the numbers make no sense is that I'm using this ruler upside down!! How embarrassing...but what a ruler, you can use it wrong and still get perfect half square triangle units!! This is so me, my first tutorial and it's all backwards....but I like lining up the flat edge! I think I picked that up from using the Marti Michell templates, try both ways and use what works for you!! Then you sew right down that diagonal edge. I start sewing on the unit with the flat corner, not the pointed corner....I'm not sure why. and here you go. A perfectly square unit that just needs the ear trimmed off. If the unit doesn't look wonky, I just trim off the ear and move on, I don't square them all up. just cut your strips 1/8 inch wider. and align the top and side of the ruler to the fabric. This is what I trimmed off to square up the unit. Here are the units, side by side. The one on the left was not squared up, the one on the right was. I used to be a "make it bigger then square up" kind of girl, no longer. This ruler is too accurate, why waste the time? If I only have a few units to make, or need to mix up my colors, I still cut my squares, draw my line, sew on each side, cut, then square them up. But for a huge number of units, where you don't mind a having a few identical ones, you can't beat the Easy Angle. Nicole is making her units using a paper method and is giving a tutorial on her blog today for that method, be sure to check it out. Don't have an Easy Angle ruler? I'm giving this one away, just leave a comment by 5:00 am Central Standard Time, tomorrow, Thursday, November 11th. No restrictions, if the post office will deliver it, you can win it. I'll announce the winner on Thursday along with the winner of the Fresh Palette fabric and rulers. oh well, it works for me! !